Note: it’s about 45 mi / 72 km from Gainesville, FL, to Ichetucknee, where we ended up at the end of the day. That recovery ride was probably better than doing nothing on our rest day, but it was still tough! Joel and Jeff are serious cyclists and though I’m sure they were going at a leisurely pace, it felt more like a normal to fast pace for us. I will say that it was refreshing to ride without gear on the back during that 1 hr ride. It makes a huge difference, and was an added incentive for us to leave as much as possible behind in Gainesville. We probably dropped 1/3 of our load there at my brother’s house. 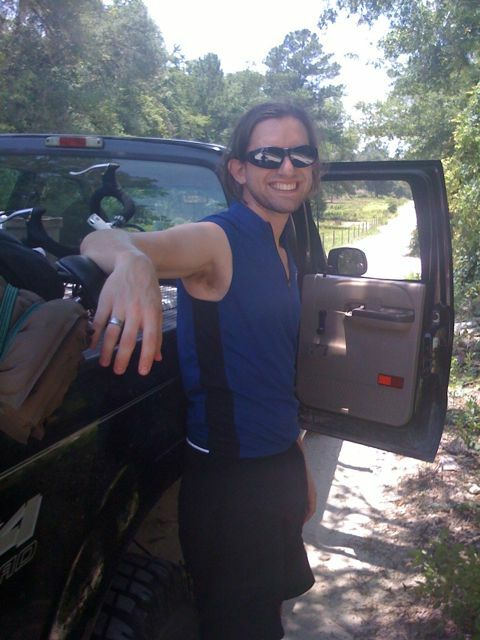 So we are sore as we head out of Gainesville, now on the Adventure Cycling routes that we brought with us, which, we soon find out, lead us along some seriously back country roads. No dirt roads or anything like that, just beautiful, often shaded, two lane county roads (e.g. CR 137). Low traffic, sometimes a shoulder, sometimes not. All of the drivers that do pass us are courteous and give us space as they pass, if they can. We stop outside a church for a break and to check how far we are from High Springs – at this point we’re looking for some significant food, not just the snacks that we have with us… a truck pulls over onto the grass, and a retired couple starts asking us about our trip… “We’ve always seen folks that look kinda like you, and wondered where they were goin’ and what they were doin'”. So we chat about our trip for a bit, and Bill and Claudia offer us some tips, giving us a better (more direct) route to take to Ichetucknee, as well as some restaurant suggestions. They also give us their phone numbers to call them if we needed anything throughout the day! We go the rest of the way into High Springs and find one of the suggested restaurants, Alice’s Parkside, which is full of locals who give us a bit of a quizzical look as we walk in with our backpacks and cycling clothes on. The folks who are sitting near us are friendly and strike up conversation, asking us about our trip, and we ask them about the parks and springs around town. This is Glenda, and she comes running out after us as we are leaving with a grand idea. I was amazed by her accent and am attempting to capture just a tiny piece of it here. 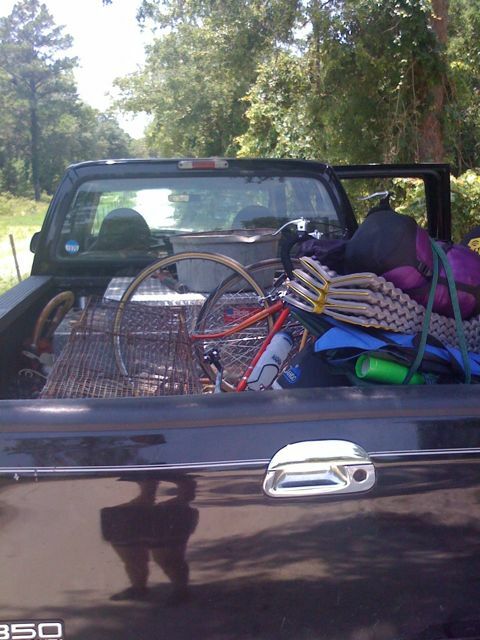 We take her up on her offer, and her 16-year-old grandson Jeremiah hops up in the back of the truck, moves around the feed bucket and cage they had used to catch and deliver wild hogs earlier in the day, and gets our bikes up into the truck. We head out of town in Glenda’s truck – quickly (“Y’all might wanna hold on! Hee-hee!”) – and visit a couple of the springs that Glenda wanted to show us (Poe Springs, Blue Springs, and Ginnie Springs). They were certainly beautiful – the folks at Blue Springs let us get out without paying to look at the “bowl” (the head of the springs where the water comes out and there are underwater caves, etc) – but they were also expensive to visit and/or camp at. For instance, it would have cost us about $45 to camp at Ginnie Springs. Too much for our budget. So we ask Glenda to take us back into town so we could just stick with Plan A and bike out to Ichetucknee, but being the kind lady she is, she insists that we let her take us directly to the campsite. All the while she’s chattin’ it up, telling us about herself and her family, asking about ours, encouraging us to get a truck – as we drive on some of these back roads it makes sense why – and all of a sudden we see a bunch of slowing and stopped cars ahead of us on the highway, and then we see why – there are 6 or so horses on the side of the road, starting to walk into the road. Glenda immediately pulls off the road in a position to block the horses from coming our way, and tells her grandson Jeremiah to “git outa the truck and go round up them horses!” He very successfully gets them off of the road and headed down the dirt path from whence they came, and the next hour or so was spent with us following the horses, trying to get them back in their pen, complicated by the fact that there were plenty of woods for them to hide in. It is a wonderful serendipitous country adventure as we try to help out the neighbors who knew whose horses they were but didn’t know how to contact the owner, who wasn’t home. 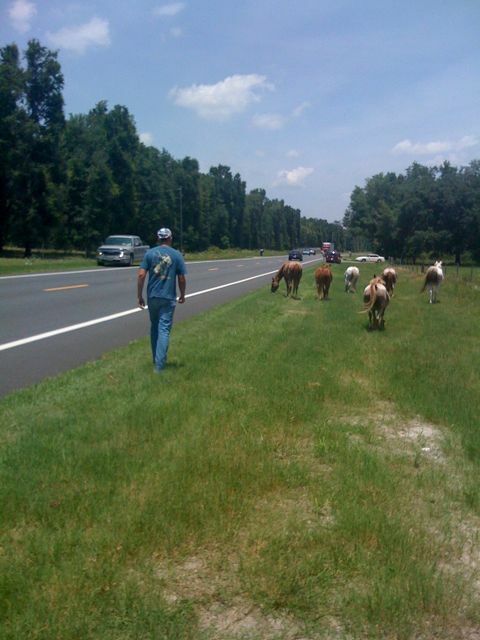 I must say Amy and I aren’t doing much besides hanging out with Glenda and neighbor Brenda as Jeremiah and the Brenda’s nephew tool around on foot and via a knobby-tired golf cart to get the horses back in the pen and fix the part of the fence where they were able to get out. 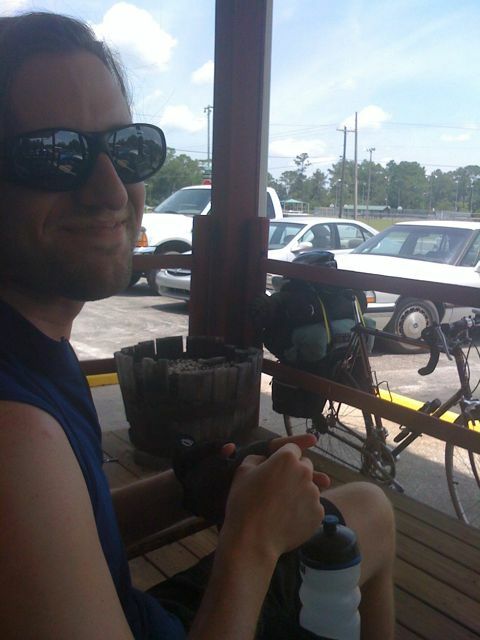 Eventually the adventure is over, and they take us to a nice, cheap campsite outside of Ichetucknee. We loved spending the afternoon with Glenda and Jeremiah and were blessed to see how she could strike up a conversation with just about anyone and make them feel loved, make them feel like a human being. We try to rest in the shade in the campsite’s grassy area, but there are ants everywhere. Amy wakes up feeling very sick and dehydrated, we set up camp and use our stove for the first time to cook a freeze-dried backpacker meal of chili. It’s hard to fall asleep (it’s hot and humid, and loud – I even wake up in the morning to, “Does anyone have anymore beers?”). I must have squeezed water out of my camelbak during the night, because there is some water in the tent again in the morning. Don’t worry about your tent, Dan, we’re taking good care of it… we dry it out every time it ends up wet in the morning :). I am glad things are working out for you guys. Keep posting! I get worried that one of you falls off your bikes and takes a fallen branch to the brain via your left eye. The posts reassure that hasn’t happen yet. I bet I check your blog at least 10 times a day hoping that you posted your latest “story.” Thanks for all the details….I love reading them. You are so inspiring 🙂 Be safe! This is fun stuff you two. I love it. This is starting to sound like Blue Highways, a book by William Least Heat Moon–and that’s a good thing. These crazy stories are my favorite. Keep inspiring! So, Nathan, did this adventure give you any inspiration for the next version of PALACE OF HORSES?